I’ve always enjoyed the texture of black fungus and try to incorporate this ingredient into my cooking whenever possible. Paired with chicken and dried lily buds and steamed, it produces a comforting and textural dish. This steamed chicken with black fungus and dried lily buds is not only delicious but also healthy as well. If you have never heard of black fungus before, it is a type of edible mushroom that grows on both living and dead wood. Black fungus (also known as cloud ears fungus or wood ears fungus due to its odd shape) is often used in Asian cooking in dishes such as soups, stews, salads, stir-fries and steamed dishes like this steamed chicken with black fungus. The name black fungus may put off some people but it is delicious when cooked. It doesn’t have a distinct taste of its own but absorbs the flavor of other ingredients it is cooked with. The texture is slightly crunchy or slippery depending on how long you cook it. Nutrition wise, it has a host of benefits including lowering cholesterol and blood sugar, nourishes and cleanses the blood, improves blood circulation, prevents iron deficiency anemia and is rich in iron, protein and vitamins B1, B2 and D. A good source of calcium, it reportedly has twice the amount of calcium compared to milk. It also has seven times the amount of iron compared to pig’s liver! Black fungus is usually sold in dried form and comes in 2 varieties – thick ones and the smaller and thinner types. I am using the smaller and thinner ones for this recipe. Soak it first before cooking. Once rehydrated, it can expand up to 2-3 times its original size. Then, cut off the hard stems and shred them to smaller pieces and use as required in the recipe. The picture above shows you the dried ingredients listed in the recipe. I forgot to add some goji berries. If you have them, you may add a tablespoon or two to steam with the rest of the ingredients. For the dried shiitake mushrooms, you do not need to use the expensive and thicker types for this recipe. In fact, I like to use smaller ones here so that no cutting is required (except for trimming off the hard stems) and I can simply pop a whole shroom into my mouth. All these Chinese dried goods are relatively inexpensive. I usually stock them up in my pantry (except the ginger) so that I can whip up dishes like this one easily. 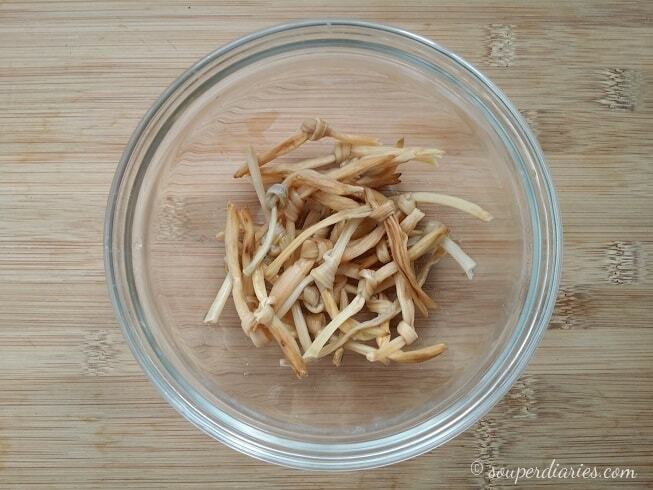 An ingredient commonly paired with the black fungus is dried lily buds. Dried lily buds come from the unopened flowers of the daylily plant. It is a popular edible flower in Chinese cuisine. Tie them into a knot and soak for around 15 minutes. Any longer and they will fray easily and lose its musky earthy flavour. The knots not only make them more appealing but serve to improve their bite and texture. They are an essential ingredient in Chinese vegetarian dishes like Lo Han Zhai (Buddha’s Delight) which some people refer to as chap chye. Another popular dish where you’ll find these dried lily buds is the hot and sour soup. Commonly known as golden needles, they are easily confused with the golden needle mushrooms. Golden needle mushrooms (enokitake) are thin and long looking mushrooms with a pearly cap on top. So do be sure which golden needles are required when you see them listed in a recipe. To make this dish more flavorful, marinade the chicken, black fungus and mushrooms overnight in the refrigerator. Or at least for 2 to 3 hours. This will let the them absorb more of the seasoning. 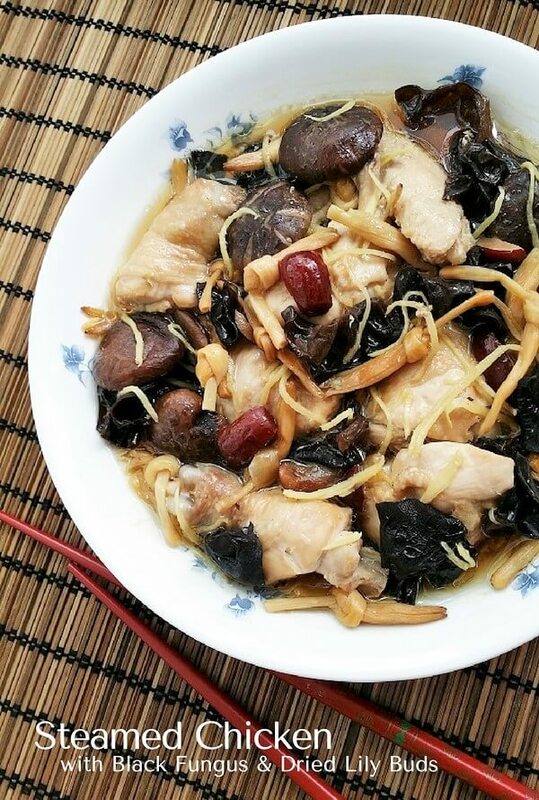 This steamed chicken with black fungus is simple, comforting and full of Cantonese flavours. I really enjoyed all the different flavors and textures coming together. I hope you’ll love the recipe too. Ready to start cooking? 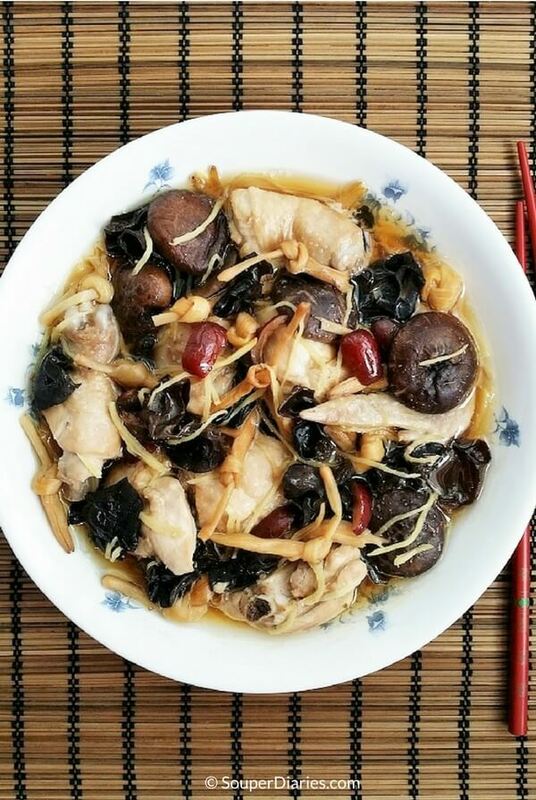 A healthy dish of steamed chicken dish with black fungus, dried lily buds and dried shiitake mushrooms. 10 g black fungus - soaked till soft enough to cut off hard stems. Then shred into smaller pieces. 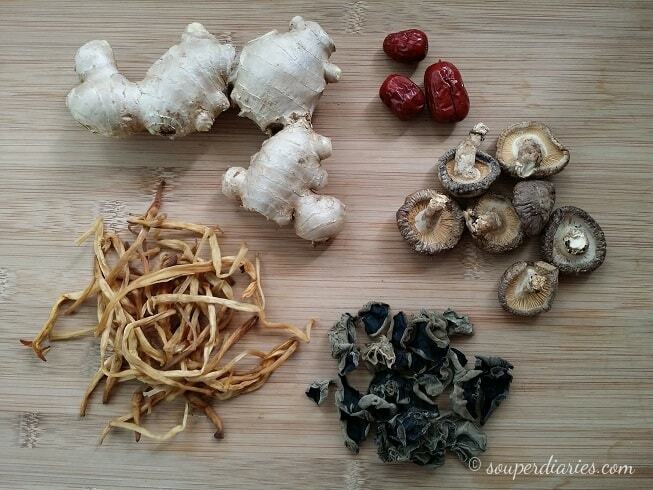 In a large bowl, mix chicken, black fungus and mushrooms with the marinade ingredients for at least 30 minutes. Prepare your steamer. Fill a wok/pot with about ⅓ water and bring it to a boil. Meanwhile, add the rest of the ingredients into the bowl of marinated chicken and mix well. Arrange them in a single layer on a wide steaming plate and steam on medium-high heat for about 15 to 20 minutes or until chicken is cooked. The longer you marinade the chicken, the more flavorful it will be. You can marinade the chicken and leave it overnight in the fridge if you wish. The Amazon links are so helpful, I am definitely going to try this recipe. Cheers! I love asian food, and im always looking for a new dish to cook. Thank you for this wonderful recipe, these ingredients are similar to what I usually use daily as well ! Right now I am brushing up on my Thai/Laos cuisines. Hoping to try this next! Thanks for visiting, Sysay. I hope you’ll like this dish. Do try it and let me know how it turns out! I must say that although the title, steamed chicken with black fungus, did not sound appealing at all, it did bring about some curiosity. I was really quite pleasantly surprised. I found it very interesting that the black fungus has relatively no taste and derives its flavor from what it is cooked with. I do enjoy eating a lot of Chinese Food and have probably eaten the black fungus without knowing it. I’ve been entertaining the font of cooking oriental in dishes at home. This recipe looks like it would be a good start or at least something to begin my Asian recipe box. My son and his wife actually do a lot of Asian cooking. I plan on sharing this recipe with them as they will probably get around to making it before I do. Hopefully they will invite me over to eat with them when they do. Thanks for what looks like a really great recipe. What a beautiful post! The dish looks absolutely divine! It really looks like something served in a restaurant! Oh. My. Goodness! That looks absolutely AMAZING! I really want to cook this tomorrow. The ingredients intimidate me a little bit though. The chicken is no problem, but I’m trying to figure out where to get some of the ingredients. Do you have a source online that I could buy them from? Does Amazon Pantry have sell them? Keep these amazing productions coming! Welcome to Souper Diaries, James. I’ve taken your suggestion and sourced for the ingredients on Amazon. I went through the customers’ reviews (verified purchases) and picked those that had mostly positive feedback. They are now listed below the recipe. Hope it helps. I love steamed chicken with black fungus! Now that lots of food is becoming unhealthy (read: deep fried), it’s good to go back to basics with a simple but good steamed chicken dish. Mmm I’m getting hungry just thinking about it! Chicken is one of my favourite foods to eat and after seeing and reading through this recipe, I definitely want to try it out. Great clear and concise instructions on how to do it is perfect to follow along with. I will have to let you know how it goes when I try it out. Would the recipe still work if I cut the ingredients in half to only make enough for two people? Hi Chris, welcome to Souper Diaries. Yes, the recipe will still work if you want to cook just for two. You can reduce the amount of ingredients though not necessarily in half but the method will be the same.